Given that my fourth book Reviving Old Scratch is due out next month (you can read book endorsements and pre-order here at Amazon) we've been talking about the Devil a lot at the Beck house. It's an inside joke. About ten years ago, when Aidan was six years old, he was asked by his 1st grade teacher to fill out, on the first day of class, some pages in a little book so his teacher could get to know him and the students in the class a bit better. On one of the pages the students were asked to fill in the blank to the question "I don't like ________." and draw an accompanying picture. And neither did Jesus! But if you struggle with how to make sense of the Devil I'd encourage you to pick up a copy of Reviving Old Scratch next month when it comes out. 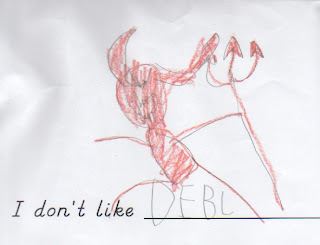 The book will help you say and mean it: "I don't like Debl."